Porsche's new Taycan will go on sale in 2019. Can it knock out Tesla's top offering? Tesla Inc.'s (TSLA - Get Report) management can see light at the end of the tunnel. The hope is that it's the sun shining through and not an oncoming fleet of electric car competition. At the end of the second quarter, Tesla began to make the turn, finally pumping out the Model 3 in respectable quantities. Because it's only producing the high-end Model 3 at the moment, CEO Elon Musk has stuck to his prior guidance of GAAP profitability and positive cash flow for the third and fourth quarters. The automaker should be able to hit those metrics without much of a problem and it's possible that Tesla's worst days are now behind it. That is assuming it can hold off competitive pressure. General Motors Co. (GM - Get Report) is planning to launch 20 electric vehicles globally by 2023. The company already has a large footprint in China where Tesla is just getting started and has the manufacturing prowess to boot. But is GM the main competitor to Tesla? One could argue it's not. A recent test of "luxury" autos with autonomous features pit the Tesla Model S and Model 3, BMW 5 Series, Mercedes E-Class and a Volvo S90 against each other. Wondering Who Won That Autonomous Test? On that note, Mercedes (DDAIF plans to launch 10 electric models by 2022, while new details continue to be released about Porsche's offering. These cars may be more comparable to Tesla's current offerings, particularly given the automaker's starting prices. For example, the cheapest Model 3 currently available starts at $49,000. 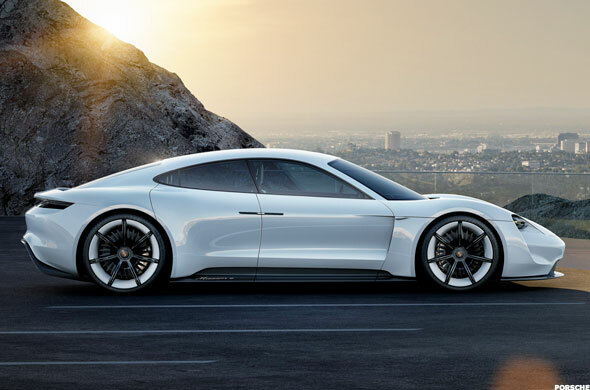 In any regard, Porsche recently confirmed some information about its upcoming electric offering, the Taycan. The dual-motor vehicle will spit out 600 hp and will achieve a driving range of 310 miles per charge. Because of its 800 -olt system, the automaker said it can charge 80% of its battery in just 15 minutes. It will reportedly speed from 0-60 mph in just 3.5 seconds. Given that we're talking about a Porsche, one would expect a near-flawless design as well -- both inside and out. The final design for the Porsche Taycan has not yet been revealed, but this is its Mission E concept. Many expect the Taycan to look similar. So is the Taycan a Tesla killer? That's to be determiend. But Tesla certainly has a chance to keep its edge over Porsche. For one, price will matter. The dual-motor Tesla Model S 100D with its 100 kWh battery can go from 0 to 60 in 4.1 seconds. While slower than the Taycan, it does get 335 miles per charge. This starts at $96,000. Stepping up to the 100D Performance series, drivers can accelerate from 0 to 60 in just 2.5 seconds, but can only go 315 miles per charge. This will cost buyers $131,000. Worth noting is that the dual-motor performance version of the Model 3 starts at $64,000. While we don't know what the Taycan will price at yet, some reports have suggested it will start near $85,000. With extras though, it wouldn't be surprising to see the Taycan end up closer to $100,000. Despite Porsche taking some pre-orders on the vehicle and already seeing strong enthusiasm from its customers, we don't even know what the final version of the Taycan will look like. The automaker also shouldn't experience the production headaches that Tesla has endured and Porsche has been a staple in the luxury segment for decades. That said, Tesla does have a few things going for it. For one, the Taycan won't hit global markets until late 2019 or early 2020, and even then the automaker only plans on producing 20,000 units in its first year. That's about a month's worth of Model 3 production for those keeping tabs. Further, Tesla currently has the most advanced battery system in the auto industry, while its autonomous capabilities are nothing to sneeze at. If Porsche is similar in performance, but has inferior battery and autonomous capabilities to Tesla at a similar price, consumers might side with the latter. That said, similar or superior battery degradation along with over-the-air updates to autonomous software all while achieving similar performance could garner plenty of attention for Porsche. On that note, while the Taycan won't be enough to disrupt Tesla completely (purely from a volume standpoint), it could be the first sign that the competition is seriously heating up.